The carver Francis van Bossuit carved his ivories with such ease, it was said that they seemed to be made of wax. This compliment contains a reversal since ivory carvers used to prepare their work in wax to create an example for their work in ivory. 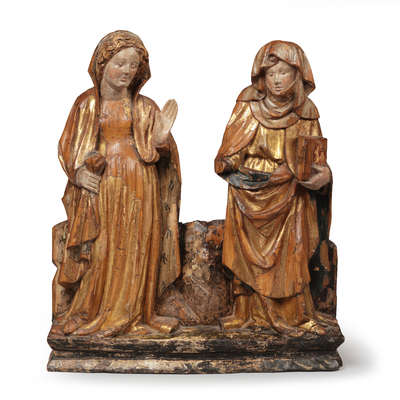 This Annunciation is a typical example of the outstanding work of the carver Van Bossuit. 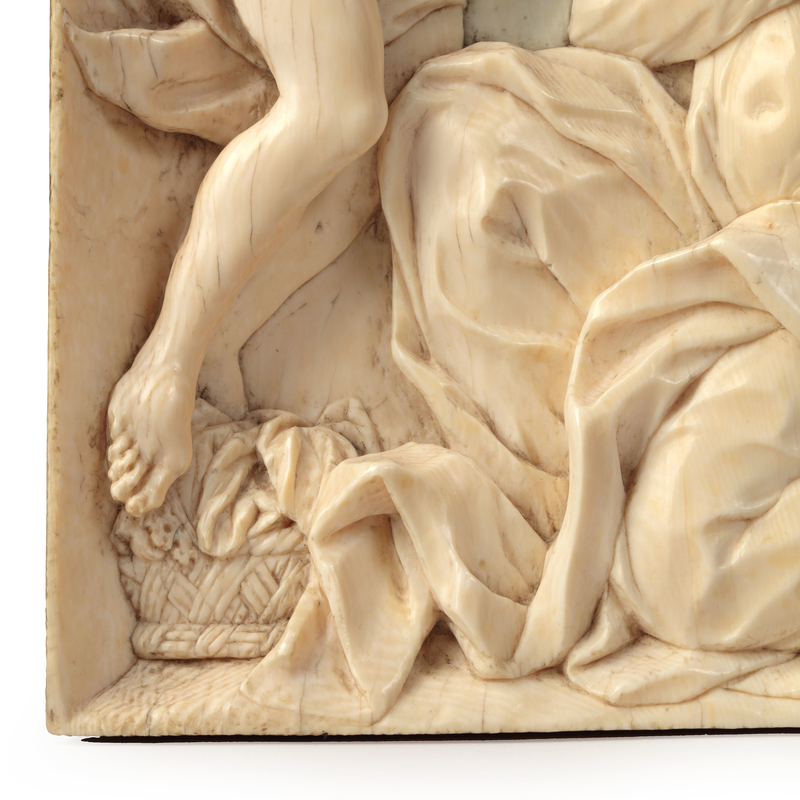 A beautiful scene is carved in high relief from a ca. 2 cm thick plaque of ivory. 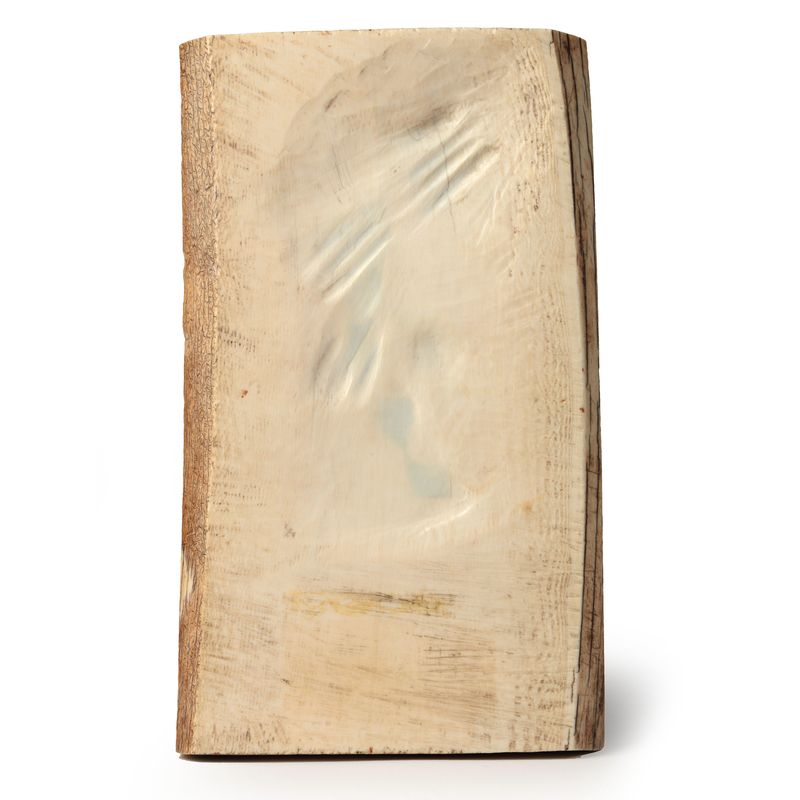 Additional depth is created by playing with the translucency of the material. Both the dove depicting the Holy Spirit entering the scene from above and the rays that surround the angel and gives us the idea that he descends from heaven, are emphasized by relief and translucency. The Annunciation is a Biblical scene in Luke 1:26-38 in which Mary is told by the angel Gabriel that she will become pregnant, have a son, and that she must name him Jesus. The relief by Van Bossuit shows the surprise and delight on Mary’s face. The young angel holding the branch delivers the message of God while pointing to heaven. 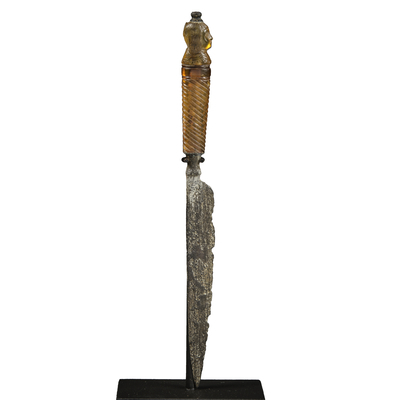 The contrasts in texture, such as the difference between a dress of smooth fabric and a thick, heavy curtain or the feathers of the angel Gabriel, are accurately rendered by the sculptor. 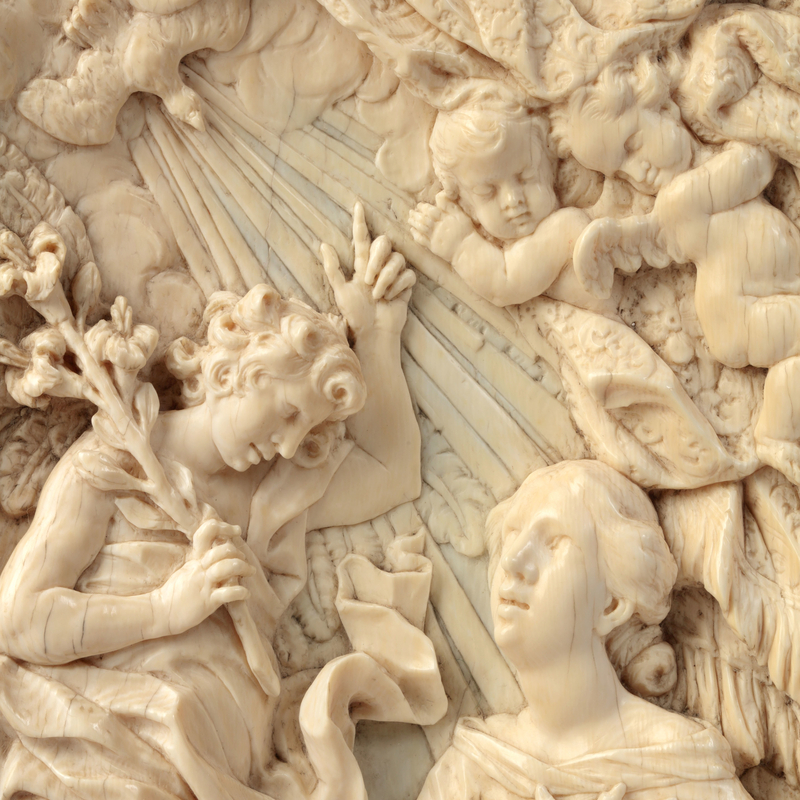 Francis van Bossuit was born in 1635 in or near Brussels where he probably received his first lessons in the carving of ivory. Even before becoming a master, he moved to Antwerp. In the biography that was published in 1727, his stay in Italy is mentioned, where he spent his youth and the best days of his life. He became a member of the Bentveughels, the Dutch artists’ society in Rome, and was nicknamed the Observer, probably because he was so skilled in carving what he saw. Although de Vita do not mention a date, it is thought that Van Bossuit returned from Italy around 1680 to settle in Amsterdam. The various works that appeared in Dutch collections until the 19th century, suggest a periode of activity in this city. Van Bossuit died in 1692. Francis van Bossuit never signed his work, and this annunciation is not an exception. However, his authorship is not doubted. In 1727 Mattijs Pool published his edition of Beeldsnijders Kunst kabinet- a work in which a large part of the oeuvre of Van Bossuit is listed in engravings as well as the aforementioned Vita. The engravings are always comparable to his known works. Although the annunciation is not published in Mattijs Pool’s Beeldsnijders Kunst kabinet, on the basis of this publication it may be concluded that the annunciation is carved by Van Bossuit. Comparison with the plaques that are attributed to Van Bossuit as published in Theurkauff, shows that the Annunciation must be by the hand of Van Bossuit as well. The characteristic hairdo of Mary is similar to that of various other women such as Venus or Rebecca in other plaques by Van Bossuit. Comparison with the plaque depicting Venus and Adonis carved in low relief by Van Bossuit and that is in the Rijksmuseum shows that the draped robes of Mary fall in the same folds as the cover that is worn by Venus. Another remarkable detail are the long fingers that appear in more works by Van Bossuit. Two ivories in the Museo Civico d’Arte Antica in Bologna are convincingly attributed by Frits Scholten to Van Bossuit on the basis of stylistic grounds in the Bulletin of the Rijksmuseum in 1999. These ivories are not mentioned in the Mattijs Pool prints either, and Scholten was able to add them to a group of seven early works that are published as early works by Theurkauff, possibly made in Rome. These two works in Bologna are explicitly mentioned because they are comparable in size and because one of them has a similar curtain in the upper right corner. The work by Mattijs Pool was published in 1727. Pool was not the draughtsman of all the images himself. 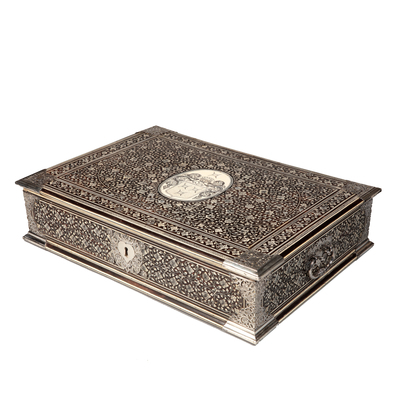 He fabricated the prints after work of his father-in-law Barent Graat who had deceased in 1709. Graat made drawings after the works of Van Bossuit. Although Graat and Van Bossuit were probably never acquainted, the painter was able to trace many works of Van Bossuit in the art cabinets of Amsterdam and made drawings after them. 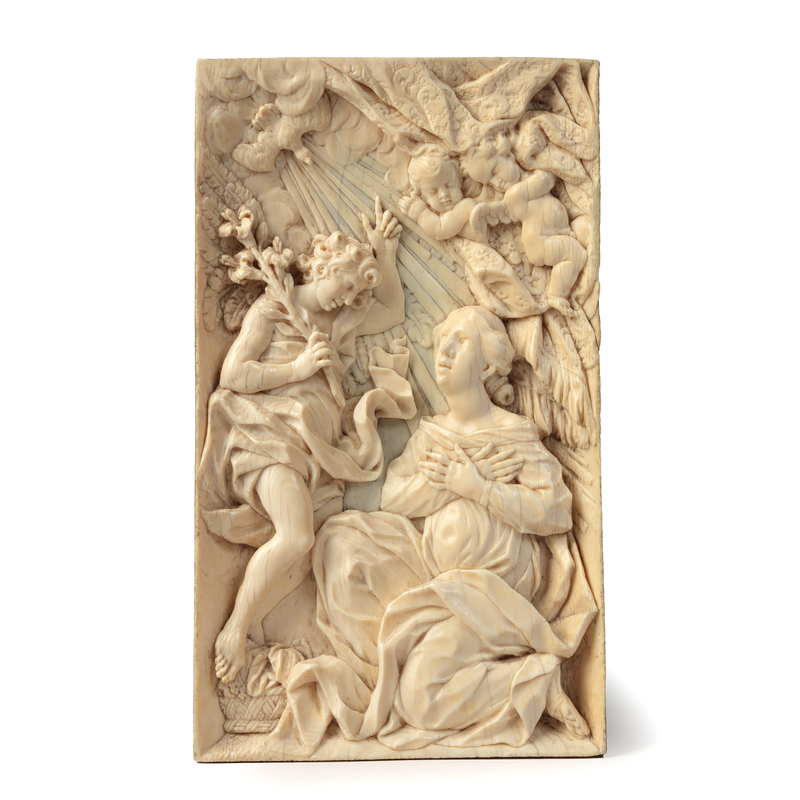 Because the Annunciation is not mentioned in this work and because there are many striking resemblances with the aforementioned works in Bologna, this plaque is made by Francis van Bossuit before 1680 in Italy.